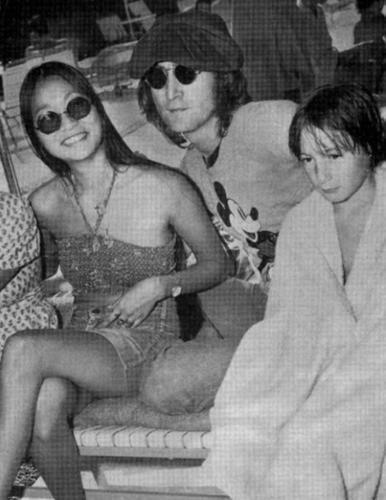 John, May Pang and Julian. . Wallpaper and background images in the John Lennon club tagged: john lennon may pang julian lennon. This John Lennon photo contains دھوپ, سیاہ شیشے, رنگوں, and سائے. There might also be بکنی, دو ٹکڑا swimsuit, غسل سوٹ, دو سومساٹ, and غسل سوٹ ٹکڑے.